Our team was all inspired to make a difference in the world, so we figured we would start at RIT. Deep down all RIT students want to be social and need a reason to come out of their dorms every once in a while. 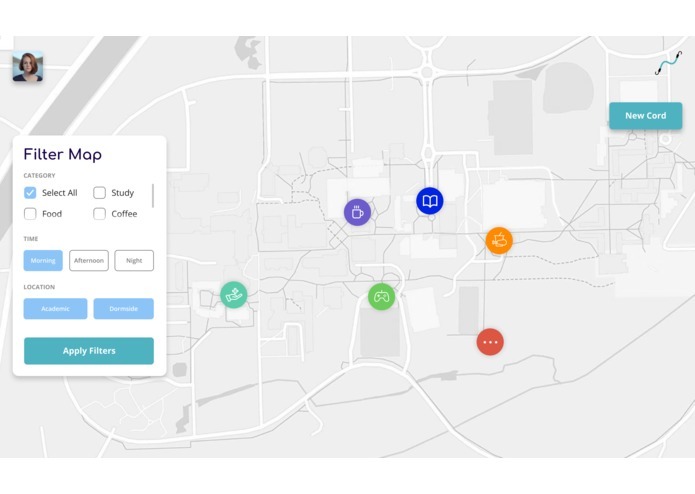 We developed a solution to this through being able to see different social events on campus and posting when there are ones. 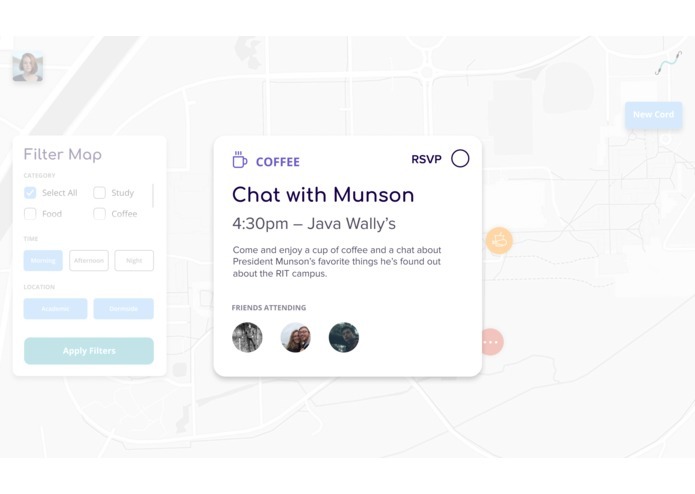 Bunji shows a real-time visual depiction of the activities that are happening in the community around someone, augmenting a user's ability to easily view and connect to social events around them in an easy manner. Starting out with Bunji, we were trying to use Vue.js to create our front-end code. We also tried to create our own database in AWS, which quickly proved to be a little too challenging for our team to handle (especially with this being our first hackathon). So, as with any good (but challenging) project, we went back to basics, and redeveloped our project using vanilla js for the front-end, and firebase for Bunji's backend. Two out of our three members were brand new to hackathons, and the one member of our team who was a veteran unfortunately had to leave early. Additionally, we set our sights a little high in the beginning of the project, attempting to learn new technologies we had never worked with before. Although this was a good learning opportunity, it ended up setting us back in the long run and forced us to think on our toes and readjust as the hackathon continued. For our second iuteration of Bunji, our designer and developer worked very closely to adjust design guidelines with what was appropriate and realistic for our new project goal. Completing our first hackathon! Because we were forced to heavily readjust, we were also forced to push ourselves through the down periods and maintain a sense of optimism throughout the project that allowed us to keep moving forward. 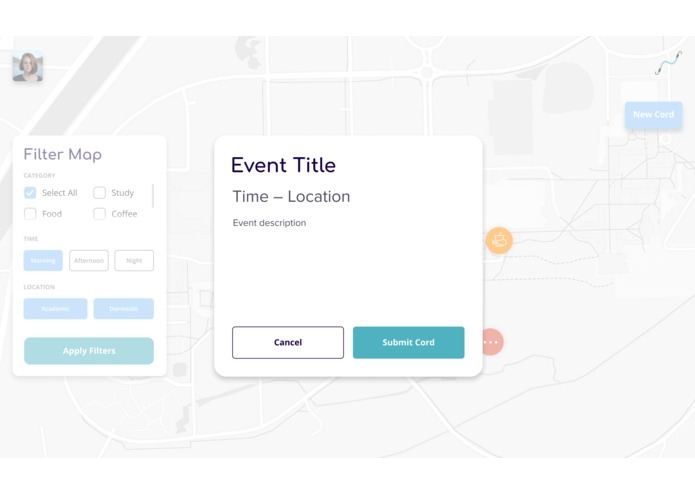 Additionally, because our team had a designer, we are proud of how our designs ended up, and recognize the areas of improvement we can focus on as well as that, because we worked closely with our designer, we have a steady foundation to build off of our initial interaction and UX models. Well, considering our first name was Bungi, we quickly learned that that just sounds like fungi (which required lots of pronunciations from our team members). On a much more serious note, we learned not to overshoot ourselves with unrealistic expectations, as well as how to readjust not just as individuals, but as a team in order to work towards our final solution in an optimistic and meaningful manner. We also learned that coding (much to our designer's dismay) can be fun when it is for a good cause, and the team members have their hearts (and numerous cans of Red Bull) in the project. Because we originally layed out a very aggressive design and interaction model, we have several important updates planned for Bunji in the future! For starters, we would like to rely more on modals in the future instead of static, fixed tabs like in our current model. We would also like to incorporate Facebook logins for an easier login process that builds off an already connected social media model. As well, we would like to incorporate a "Coordinate" tab, that allows a user to see what Cords they have made, what cords they have responded too, and what cords are popular around them. Because of the success of pinterest, we would also like to build off of the ideas that application incorporates and include a like or subscribe feature in the future. As the only designer on Bunji, I was solely responsible for our design research process as well as the wireframing and styling components of Bunji's final product. I researched existing market solutions in order to build off of successful models, as well as created high-fi wireframe components for our developers to use when coding up bunji's system. Because our team was low on members, I was also asked to step in and help throw my hat in the ring for some good old css/html coding, making sure styling components were correct for bunji.